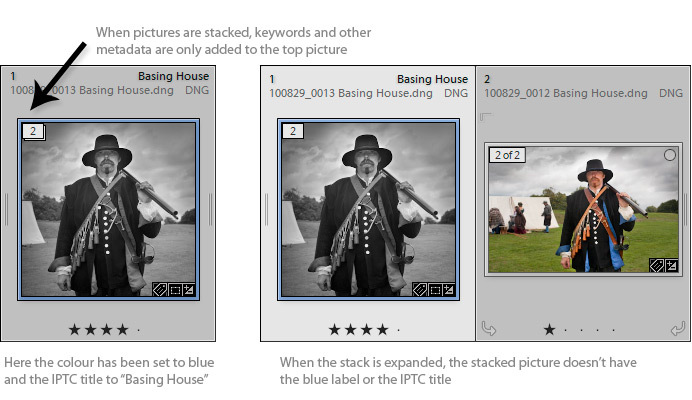 When you add metadata like the title or keywords to a stack, Lightroom only updates the picture on the top of the stack - items lower down the stack are not updated. So if you do want all members of the stack to share similar metadata, you first have to expand the stack and select all the items. Then after adding the metadata, you would collapse the stack again. 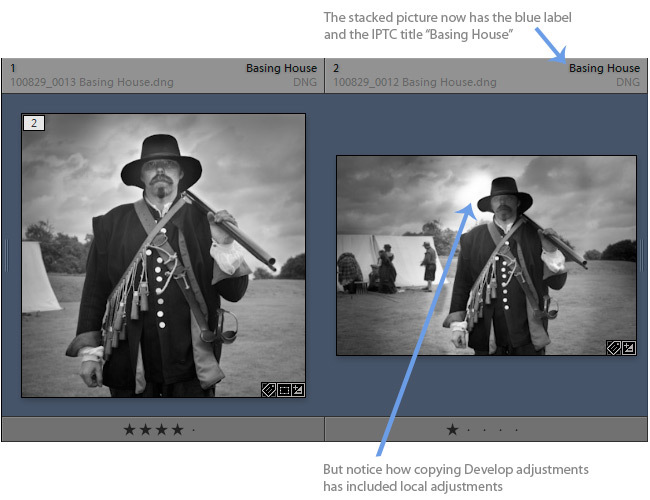 For some users, that is OK because they will only keep the best image and don't want to annotate the rejects. But for others it's pretty inefficient, for instance stock photographers or those who use stacks to gather frames intended for panorama stitching. For them the stacks-metadata problem is often a reason for not using the stacking feature. Select the pictures including some which are in stacks and choose the mnu command Library > Plug-In Extras > Sync Stacks. You are then presented with a dialog box. Sync Stacks will normally copy all IPTC metadata. But by default it excludes the star rating - that's because the top item in the stack often has a different rating from the rest of the stack. Sync Stacks can also copy Develop adjustments. It may be what you want to do, but be careful with this feature. When you are have ticked the appropriate check boxes, click OK. Otherwise, click Cancel. 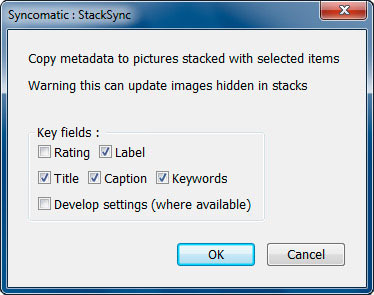 Syncomatic's Sync Stacks command works only on stacking created in folders, not on collection-level stacking. This is because until Lightroom 4 you could only create stacks in folders but when that changed Adobe never added code to detect the new collection-level stacking. You can launch Sync Stacks when you are are working in a collection, but Sync Stacks is still only detecting folder-level stacks. Read more about how to use stacks here and here.